Whether it?€™s poker or finger football you and your buddies enjoy a rousing game to get everyone excited before you root for your team. Let your tailgating crew know that you have their Buckeyes pride covered when you show up with this Collegiate tablecloth. Featuring vibrant allover team graphics and sized to fit any standard card table this tablecloth will add a touch of Ohio State spirit to any occasion. Whenever you get the gang together you can rest assured that this Ohio State-themed tablecloth is a sure bet! Add a touch of Ohio State spirit to your yard with this garden flag featuring a sewn-on embroidered team logo applique! Your neighbors will know where your loyalty lies when you display this little cheerleader in your yard! Add some Buckeyes spirit to your porch or garden with this dazzling wind spinner featuring a team logo in the center of glittery team-colored scalloped rings for a mesmerizing lighting effect. Just attach the free spinning clip onto a tree or porch ceiling to watch the wind create a breathtaking OSU-spirited effect! Bring a little whimsy to your backyard or garden with this 11.5″ tall Ohio State football Garden Gnome! Keep your food and drinks cool with this insulated lunch bag featuring the team name logo and colors! Keep track of the precipitation and add a little Buckeyes flair to your lawn with this team-spirited rain gauge! It features a bold team logo and vibrant team colors and is specifically designed to have the rain water magnify the numbers by more than thirty-five percent. After all the grass is always greener on Ohio State’s side! Hey Buckeyes fans – you don’t have to have tallboy cans to enjoy this Tallboy Rolling cooler but it wouldn’t hurt! The next time you get together with your friends you can show your Ohio State pride while transporting your favorite beverages and snacks. The sturdy base features two wheels and an extendable handle making it super easy to get your gear to the tailgate or gathering. There is a separate compartment at the top that is perfect for a casserole dish or additional supplies. Last but not least this cooler boasts bold Buckeyes graphics printed front and center. You’ll be standing tall with pride with your new tallboy cooler! Some think that there?€™s nothing better than sitting out on the porch in peace and quiet. Yeah right not for a Bucks fan like you! You need to be around Ohio State spirit every day. Display your team love with this OSU metal streamer wind chime featuring the school logo on a double-sided blade and a team-colored streamer design on the chimes. The sweet chime of team pride ?€” now that?€™s music to your ears! Let your Buckeyes spirit light up the whole neighborhood with this solar-powered projection rock. Made of hard resin that resembles stone this weather-resistant garden rock will discreetly hide in your driveway during the daytime storing solar energy and project a Buckeyes logo on the surface of your choosing at night. 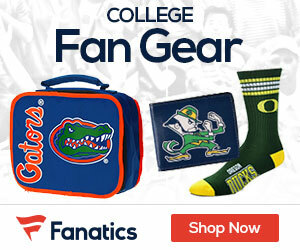 Now you can let all your fellow fanatics know when it?€™s game time! Like a signal for superheroes this projection will have your buddies throwing on their game day gear and heading to your man cave for some OSU action. Whether you?€™re prepping for the tailgate or packing your weekday lunch make sure your indomitable team spirit is on display with this insulated Buckeyes lunch bag. Featuring printed team logos and an adjustable carry handle this lunch bag makes showing off your team pride easier than ever. Since this zippered lunch bag is big enough for six aluminum cans or the perfect size for an awesome OSU-inspired lunch you can tote it just about anywhere. Keep game day drinks cool or your lunch fresh so you’re all fueled up to cheer on the Buckeyes! A bird is a man?€™s best friend. Well maybe that?€™s not the saying but they certainly are in your life. Nothing is too good for your feathered friends especially when it comes to feasting. Charm all the birdies in your neighborhood with this Buckeyes-inspired wooden bird feeder. It has two perches is easy to fill and has Buckeyes logos printed on each side panel. All the warblers wagtails and pipits will be flocking to your yard to dine from the most Ohio State-spirited feeder in town. Make sure all who enter your fan cave or tailgate know they’re in Buckeyes territory! Show off your Ohio State fanaticism by hanging this fan banner for everyone to see! It features a vibrant applique Ohio State wordmark and comes with hooks and grommets for easy hanging wherever you wish to display your team pride. No one will question who you root for on the field! Now the wind can be part of your Buckeyes fanaticism when you display this team-spirited Yard Spinner in front of your home on game day. It features a double rotor windmill system with alternating team-colored ribbons printed team logo on the front and the team name printed on the back flag for a prideful look that’ll be the envy of all your neighbors! Spruce up your Buckeyes game day festivities with this team logo bunting. It features ruffled team color panels with an Ohio State logo in the center and metal grommets for easy hanging. This vibrant bunting measures 51″ x 27″ and is made from water-repellent and UV-resistant fabric so you can hang it inside or outside to spread your OSU spirit! No matter the weather or occasion now you can show your team spirit to everyone in style. Mark your home as Buckeyes territory with this 12.5?€ x 4.5?€ resin Garden Sign. This hand-painted sign features team graphics on a team-colored background and includes a 12.5?€™?€™ metal stake. Whether you put it in the yard by a walking path or in the garden this fun piece of lawn decor ensures no one will ever mistake who you cheer for on game day. This rollling cooler is the perfect way to easily tote your tailgating essentials to the next Buckeyes game. It features printed team graphics a fully insulated main compartment large enough to hold a variety of drinks and treats a removable plastic liner for quick clean-up a front zipper pocket and two side mesh pockets. It?€™s also collapsible for easy storing after the game! Measure the temperature with this officially licensed thermometer! All plastic construction with a built in hanger. Measures 12.75″ in diameter and comes ready to hang outdoors. Made in USA.